Located in northwestern Santa Rosa, California, Northwest Prep Charter School was originally founded as a vocational Career Academy in 2005. In 2012, NWP was completely reinvented and began implementing a Project-Based Program of Inquiry. Northwest Prep’s student body of 120 students in grades 7-12, is small by design. Establishing and maintaining close working relationships is a tenet of Northwest Prep’s highly personalized program. Grade levels and curriculum are blended at NWP and all academic subject areas are integrated so students can comprehensively investigate topics defined by each semester’s Driving Question. The NWP Leadership Skills (Personal Integrity, Productive Collaboration, Critical and Creative Thinking, Effective Communication, Reflective Learning, Citizenship and Global Responsibility, and Resiliency and Drive) are both the long term goals and the means of assessment for all students. At Northwest Prep the personal and academic development of each individual student, their unique needs, interests, gifts, skills, passions, and attributes, are recognized and honored. NWP’S intent is to engage each student in a process of learning that results in the most productive and meaningful realization of each students's potential and success. • Northwest Prep is fully accredited by WASC (Western Association of Schools and Colleges), and was awarded a Six- Year accreditation in March of 2016 good through June 30, 2022. •In April of 2013, Northwest Prep received Sonoma State University’s Jack London Award for Educational Innovation. Northwest Prep employs a narrative academic reporting system given at the end of each semester as well as grades for their coursework. Reports show credits earned for that semester as well as a cumulative credit total for all high school courses taken. Courses taken at the college level are noted as such and awarded AP credits. Grade point average is computed for all high school students at Northwest Prep. Honors and AP classes are not offered at NWP but all upper grade students are encouraged to take at least one college level class to demonstrate college readiness prior to graduation. Northwest Prep Charter School does not offer a formalized sports program, but each day students participate in 30 minutes of a physical activity of their choice including volleyball, soccer, basketball, supervised hiking at the adjacent Laguna De Santa Rosa and other planned activities depending on the weather and student interest. Our students often choose from a broad range of local community and private sports-based activities. Students must earn a minimum of 220 units to graduate. Northwest Prep integrates into its curriculum the minimum expectations for graduation, following California high school graduation requirements. 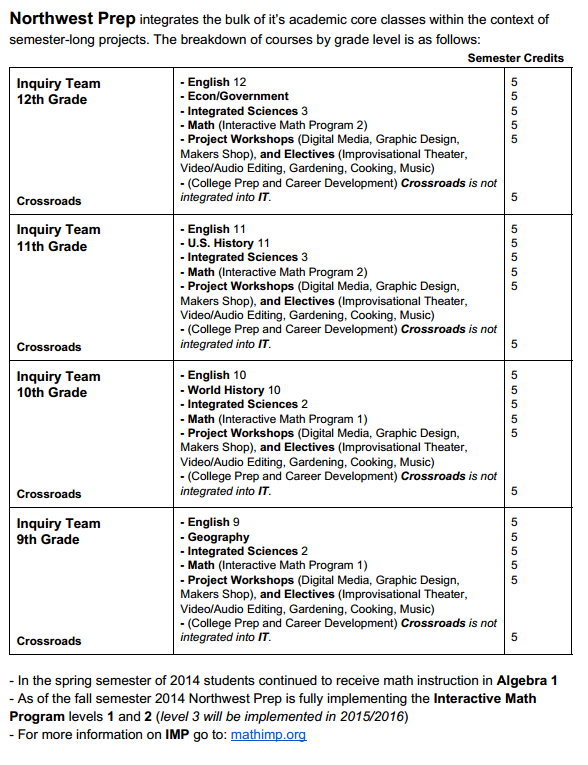 Students must pass eight semesters of Inquiry Team and Crossroads (see table on back) Additionally, students are also required to complete two professional internships by the end of their senior year, and successfully pass a Portfolio Defense before a panel of peers, staff, and community members. All Northwest Prep seniors apply to at least one college of their choice, and most NWP graduates subsequently attend either a four year or junior college. Colleges that have accepted Northwest Prep students include: UC Davis, UC Santa Cruz, UC Riverside, UC Merced, Humboldt State University, Sonoma State University, San Francisco State University, CSU Chico, Sacramento State University, CSU East Bay.